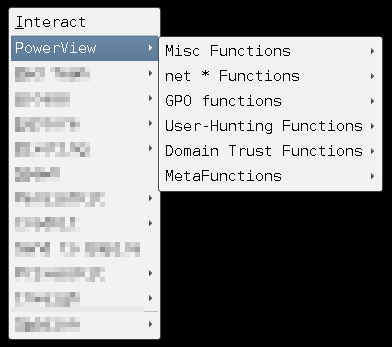 All functions listed in the PowerView about page are included in this with all arguments for each function. Each function allows for the user to specify if they want to use PowerPick or PowerShell inside of the CS beacon. The script does not automatically do powershell-import for PowerView you must manually do that first. Use to gain code execution on any Splunk instances you have access to, code execution on deployment clients, and decryption of credentials stored in Splunk apps. SecSmash is for leveraging credentials to IT systems to enumerate connected hosts, and send commands to those hosts. We are launching with Carbon Black and Tripwire integration. We've built an HTTP integrator that takes inputs, and extractions to generate new inputs, to drive a chain of HTTP request to authenticate to the target system, enumerate connected hosts, and run commands. Integrations can also be built from scratch if they match the Integrator interface. Because eternal blue is such a useful exploit for red teams now and into the near future, we developed a powershell port of RiskSense-Ops metasploit module. This port of the exploit is 100% powershell, and can be easily imported and used in Empire, or Cobalt Strike shells.